School Tour Schedule – Experience Joy in Learning! We offer monthly tours throughout the year, which include an educational tour and the opportunity to observe the classrooms, buildings and grounds for Kindergarten through 8th grade. You’ll also have a chance to ask any questions you might have. Not ready to sign up just yet? Learn more about or school. Tour - Quick RSVP <— CLICK TO RSVP or Call (847) 526-1372. If you are considering Da Vinci Waldorf School, there are a few great ways to take that first step. We offer experiential “Songs & Storytime” (free preschool class) for parents and their children (ages 2-5). You can join us and see for yourself what your child will experience in our Early Childhood classrooms. Join us for one of our Festivals or public events! These are a perfect opportunity to have some fun while observing our community and taking a look around, pressure-free. To schedule a tour, request a free preschool class, or ask a question, Call (847) 526-1372 or Contact Us! All are invited to tour our school! There’s a world of discovery ahead for your child, and Da Vinci Waldorf School is the perfect path to begin exploring it. Whether your child is in preschool, kindergarten, or grades 1-8, our programs offer outstanding preparation for your child’s happiness and success in the future. 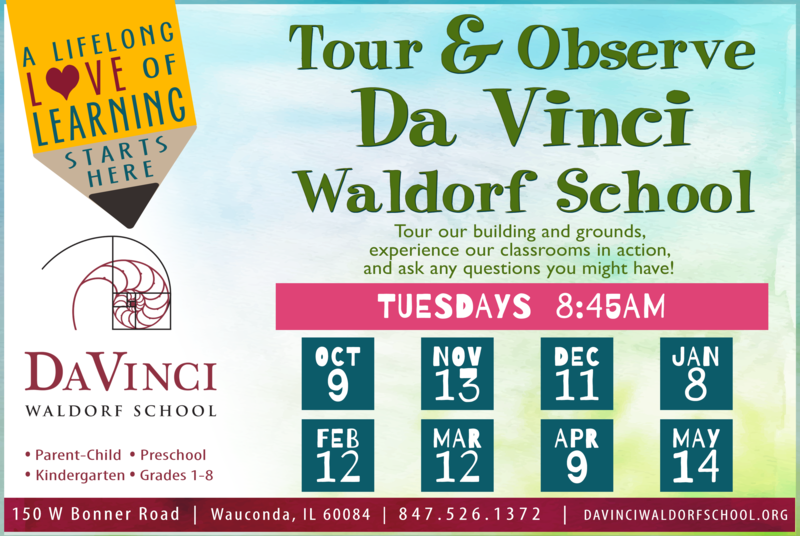 Join us on a school tour and observe Waldorf education in action! Experience the warmth of our Early Childhood classrooms. Watch the lively engagement of our grade school students in math, science, and history—taught like you’ve never seen before. Movement. Music. Joy in learning. Come see for yourself our nurturing, inclusive and inspiring curriculum in action!